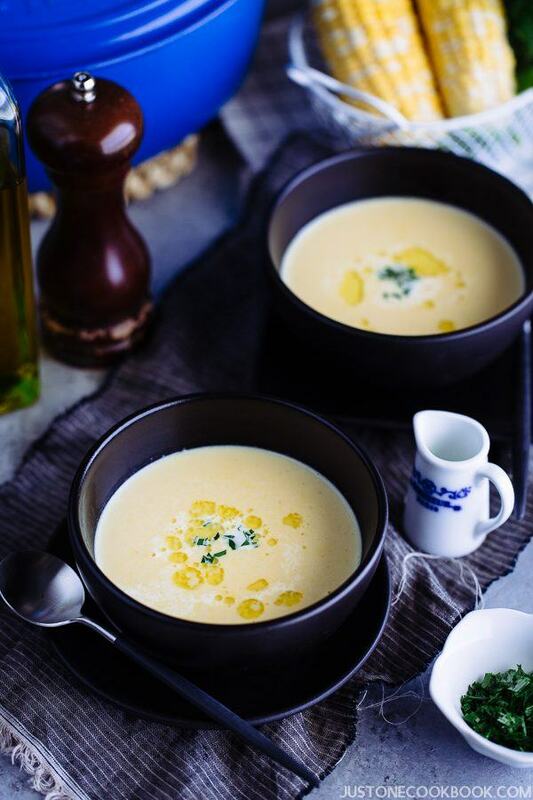 The Japanese love their hot or chilled corn potage and corn soup. This creamy and smooth soup will give you comfort as you welcome the cool evenings of late summer! One of our family’s favorites, sweet corn, is in season from June to October. While we spent the summer in Japan, I received a lot of recipe requests for Corn Potage and Japanese Corn Soup. As soon as I returned, I quickly refined my original recipe so I could share this late, late-summer soup with you. 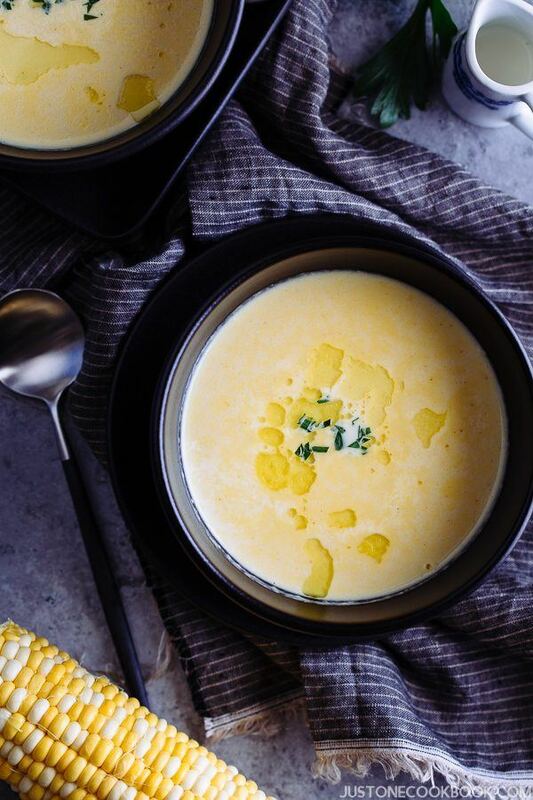 As the nights are starting to make subtle shift with a touch of cool air, this Japanese Corn Potage or Corn Soup would be the coziest way to savor the deliciousness of the last of season’s produce. What is Corn Potage (Japanese Corn Soup)? Potage itself refers to thick soups, stews or porridges, which has its origins in the middle ages cuisine of northern France. Despite it is a western-style soup, there is no western recipe for corn potage on the internet. 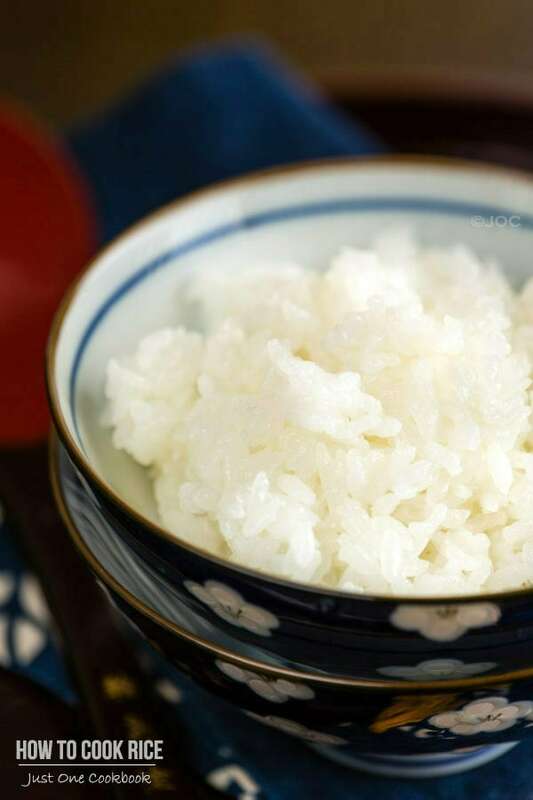 Instead you would find Japanese corn potage recipes. So what is corn potage? It’s a super creamy corn soup made with fresh/canned/frozen corn, onion, milk, and heavy cream. It’s ridiculously simple. 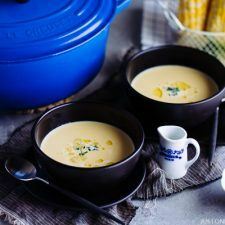 This creamy corn soup is called “potage” where the corn kernels and soup are blended till smooth and strained through fine mesh sieve. As a result, the soup has no fibers and the texture is silky smooth and creamy with a somewhat thick consistency. When the soup is not blended and still has chunky bits of corn, we usually refer to it as corn soup. However, some people would call the creamy corn potage with thick consistency “corn soup” as well, so it may be a little confusing. Both corn potage and corn soup are especially popular among children because Okosama Lunch (children’s menu) often includes corn potage/soup as a part of the kid’s meal next to Ebi Fry and Hambagu. We all grew up drinking corn potage and there is a nostalgic feeling attached to this soup for the Japanese. 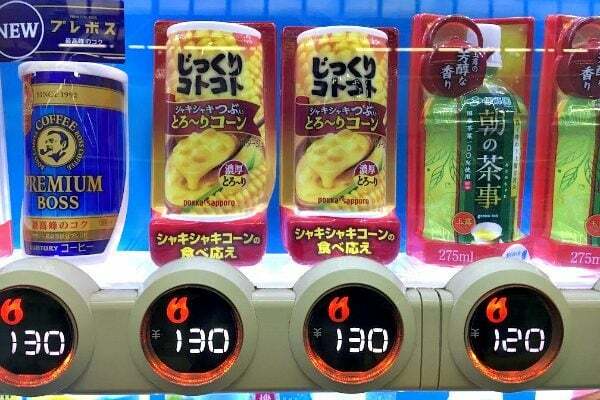 If you’re in Japan, you can even get corn potage from the vending machine! 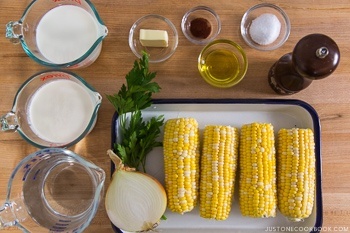 If you’re using fresh corn on the cob to make this recipe, do not discard the cobs! Make sure to add them in the soup while cooking as they release delicious flavors and sweetness to the soup. If you prefer strong corn flavor in your soup, I highly recommend cooking the soup with just water and get the maximum corn flavor out of the corn kernels. 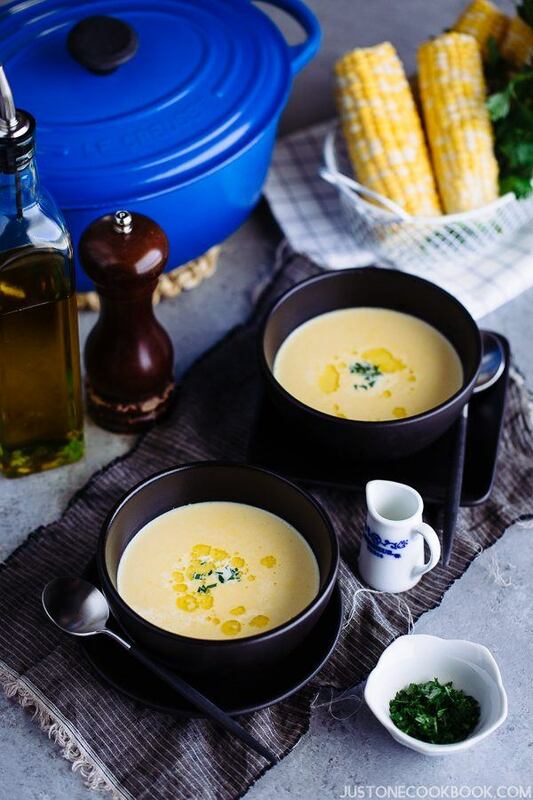 Some other recipes for corn soup/corn potage recommend using vegetable or chicken broth or bouillon and I’ve tried them, but being a purist I stick to using ONLY water to extract the sweet corn flavor for pure undiluted taste. I assume most of us prefer rich and creamy soup, but not everyone can afford getting extra calories from heavy cream. It’s entirely up to you how much heavy cream you want to add in this recipe. Feel free to adjust the ratio of heavy cream and milk for the 2 cups you add into the soup. 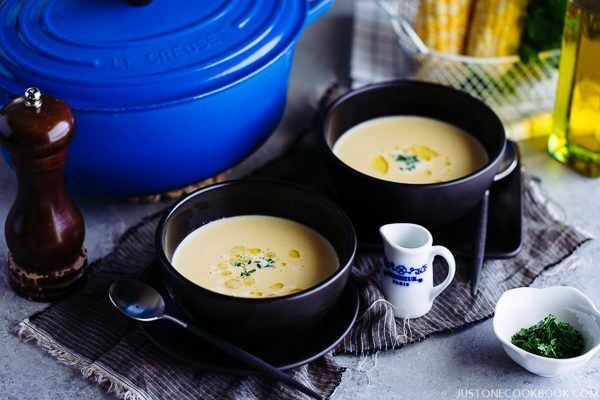 Which Do You Prefer: Corn Soup or Corn Potage? When comes to the texture, you can choose to blend the corn kernels and strain, blend but not strain, or keep the corn kernels as they are. It’s really a personal preference. For those who have tried corn potage in Japan and love it, I’m sure you would prefer following today’s method. Gather all the ingredients. Preheat the oven to 450 ºF (230 ºC) degrees. Slice off the corn kernels. Place the corn kernels on a rimmed baking sheet, saving the cobs for later. Add olive oil, sprinkle of kosher salt, and paprika. Mix all together with your hands and spread out evenly in a single layer. Roast the corn kernels at preheated oven at 450 ºF (230 ºC) degrees for 15 minutes. Once it's done, remove from the oven and set aside till Step 8. Meanwhile, thinly slice the onion against the grain. Heat the butter in a heavy-bottomed pot (thicker at the base so it absorbs and distributes heat better). Add the sliced onion and pinch of kosher salt and sauté until translucent. Add the roasted kernels and water. Add the reserved cobs in the pot as they naturally sweeten the soup. Push the cobs down to see if they are covered with water. If not, add more water. Bring to a boil over medium heat. Cover and lower the heat to medium-low heat and simmer for 15 minutes. During this time I highly recommend skimming the foam on the surface for more refined taste. After 15 minutes, discard the cobs. Using an immersion blender, blend the soup until creamy and smooth. If you use a food processor or blender, let the soup cool for a few minutes before you start blending to avoid major splashes. Make sure to cover the hole with a towel when blending. If you want to make your soup similar to corn potage (Japanese corn soup), strain the soup through a fine-mesh sieve for a smoother consistency. Transfer the soup back to the pot and add heavy cream and milk. The ratio is entirely up to you. Here I used equal parts of milk and heavy cream, 1 cup each. Bring back to a simmer and cook uncovered for 10 minutes or more, stirring frequently. Once the water evaporates and it’ll be more flavorful. Add kosher salt and freshly ground black pepper. Make sure to taste the soup when you season. I used roughly 1 ½ Tbsp kosher salt or so (I used up a total of 2 Tbsp kosher salt that I prepared for this recipe including salt I used for roasting corn and sautéing onion). Or individuals can decide how much salt they want for their personal serving. Finely chop parsley. Serve the soup hot or chilled. You can drizzle olive oil and/or heavy cream and sprinkle the parsley to garnish. I Completely fell in love with the canned corn soup/potage on my trip to Japan a few years ago (once I got over my shock at having warm soup! in can! from a vending machine! ha). I took a picture because I was soo in love. I’m soo happy to have the recipe, I can’t wait to try it! Thank you! What a delicious rich yet light soup to enjoy now that it’s getting colder. I love cold every which way and I have not had corn potage specifically so this is great. Love how you cook the soup using the cob. I can totally imagine the sheer corn flavor, with the added richness of milk and cream. A worthy splurge. Just wondering what do you do with the strained corn and onion mixture? I was thinking cornbread, but haven’t found a recipe yet. Thanks! Nami, how do you make the mini pancakes? 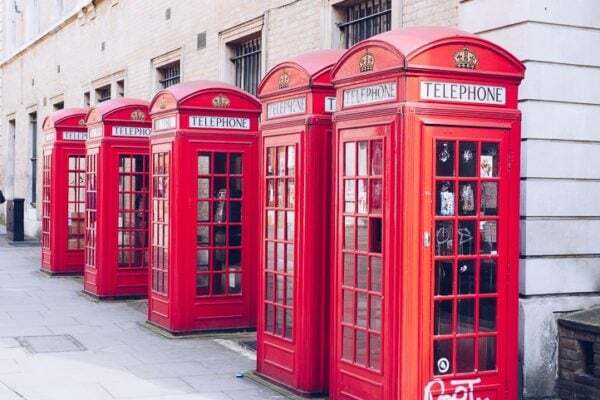 I would like to try. How much corn do you add from a can (in grams)? 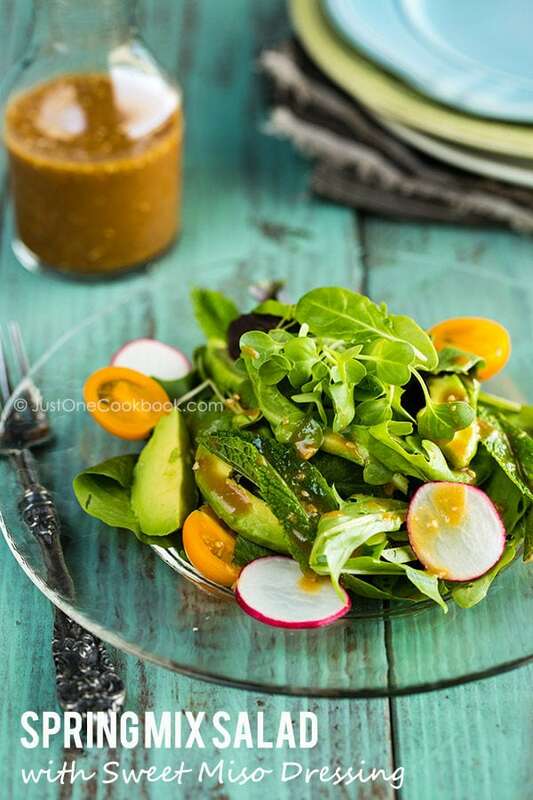 Could you make this with Almond milk and coconut cream to make this dairy free? I made this tonight and it’s absolutely amazing!! Am I dreaming? Is this my stove or is it a vending machine? Your recipe works exactly like the corn potage from the vending machines in Japan Nami! I have another variation, though. It’s without seasoning the corn kernels with either salt or paprika. And then after I have strained the corn, I add stir fried ground chicken. Salt I add during the final simmering process together with ground black pepper. I actually discovered this by accident of forgetting to season the corn kernels. But now I feel that if I intend to add ground chicken, then I better not season the corn kernels. It makes a better balance, not too tasty. But of course it won’t taste like the corn potage from vending machines in Japan. Just sharing my experience. Speaking of soup and vending machines, can you share a recipe of onion soup like the ones from vending machines? That’s my other comfort food (or drink? hahaha) during winter in Japan. Oh yeah, one question. 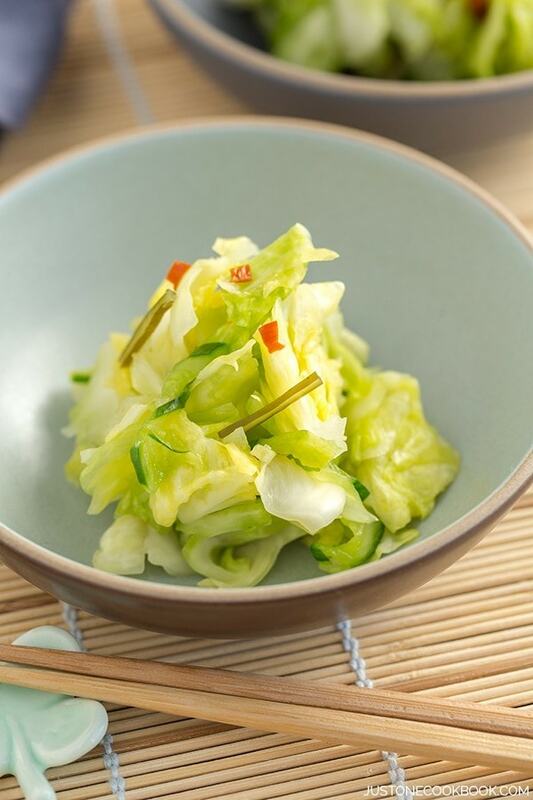 Step 13 on this recipe: “Once the water evaporates and it’ll be more flavorful.” –> What water? I meant “liquid” instead of water. Thanks for noticing. In Japanese, it’s more like water portion 水分, so I probably wrote water… thank you! Hahaha… so it’s actually 水分. Then I get it. Hi Shuni! If you don’t get this response, let me know? We were using one comment response plugin for many years, but it’s outdated, so we switched to a new plugin. Maybe when I responded, it was during the switching process and you may didn’t get the notification… so far readers have responded back to my response, so they must be getting notification after switching to the new plugin. Thanks for letting me know about the onion soup, I’ll try this summer (I hope they do have it in summer…). Vending machines in Japan don’t sell can soup/potage in summer, do they? 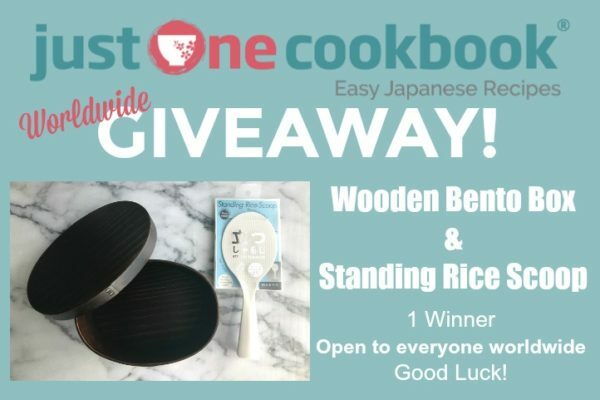 I wish you luck then, so I;ll be lucky to learn the recipe ???? Btw, talking about recipes, I asked about okowa recipe on your blog anniversary post, if I remember correctly. Maybe you had already replied. But if not, then may I rewrite it here. Thank you. Hi Nami, I wonder what does roasting the kernels do to the taste/corn texture? I was looking at several recipes but so far only yours calls for roasted kernels, while the other recipes goes straight to boiling the corn kernels. 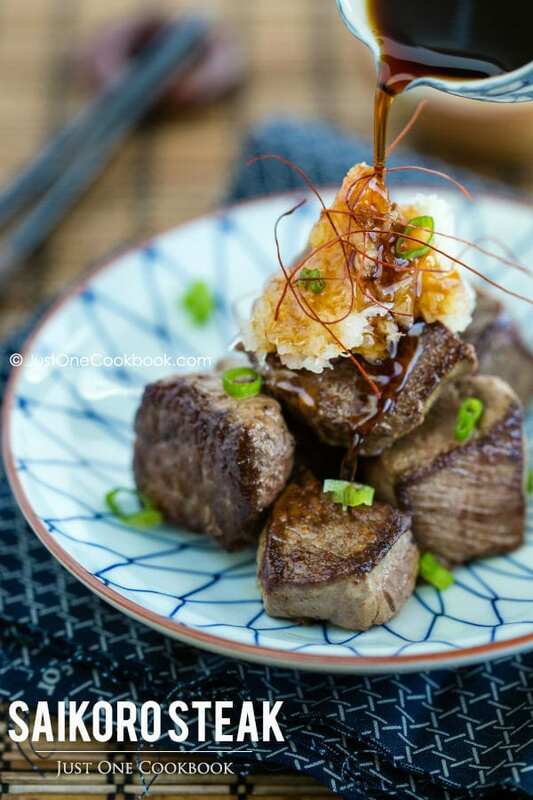 Thank you for posting this recipe Namiko! I was having a bad day and this was the perfect thing to cheer me up. This soup is like a hug from the inside, truly comfort food! Hi Brittni! I’m sorry you had a bad day, but I’m glad this recipe cheered you up. 🙂 Having a really good food comforts me too. Thank you for your kind words and sending virtual hugs! We just had this for supper, utilizing what happened to be the exact amount of corn needed that I had leftover from last night. It was already cooked, and I’d saved the liquid I cooked it in (I boil in water, milk, and aromatics) since that was already so infused. I followed the rest of the recipe from after the roasting step since the corn was cooked, and used the reserved liquid as the water and milk called for. Happened to have leftover Texas toast made from that amazing Japanese fluffy bread which, cubed up, made really great croutons on top. I wanted to serve it cold on this hot day after spending the day in the sun at a festival, but didn’t have time to chill it so we ate it hot. My whole family loved the soup. Hubby who is from Ohio mused that he doesn’t know people in Ohio don’t make this all the time from all their corn. I’m really excited to try this recipe next!! I just made your creamy cauliflower soup and it’s so good!! One questions on this recipe though: how will the soup turn out if i don’t use heavy cream and replace it with milk?? Hi Jamine! I’m glad to hear you enjoyed the creamy cauliflower soup; that’s our favorite too! You can use milk instead of heavy cream – just lighter version. I usually switch up these two ingredients, or the ratio of the two to make slightly different variations. 🙂 Thank you so much for your kind comment! I forgot to ask.. my sister is lactose. Are there other options besides using lactose-free milk?